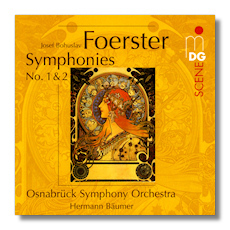 It is inexplicable how a composer like Josef Bohuslav Foerster who lived to the ripe old age of 92 and whose numbered catalogue totals some 190 works has remained neglected up to the present day except for one symphony, his 4th known as "Easter Eve" which remains moderately popular. Among his large-scale pieces, one can find six operas, five symphonies and a crop of programmatic works, but in the Czech Republic apart, his music is hardly ever heard. This is certainly not due to the quality of his compositions, but the fact that his art cannot be identified either with the Bohemian tradition or with the standards prescribed by the Socialist school of thought has left him somewhat in between two stools. This is tragic indeed, as his music is full of attractive melodies and the descriptive nature of his symphonies is etched out with consummate mastery. This MD&G release of his first two symphonic essays is nothing short of invaluable as none other of his symphonies except the aforementioned Fourth have ever been recorded. The first dates from 1887/8 and its language alternates between the idyllic and a grave sense of solemnity. The second was written five years later and is dedicated to Foerster's sister Marie who died in 1890. More dramatic in scope and style, the work has many arresting moments depicting the struggle between death and redemption. Bäumer and his forces perform with full-blooded enthusiasm and their commitment to the Foerster cause is unflinching throughout. A memorable disc in excellent sound and with informative annotations which should help the composer attain a more deserving image.